Wake up to a front row, waterfront view of Langelinie pier, the Opera House and the Royal Danish Playhouse. Our modern city hotel is designed in a Scandinavian style, and offers a wonderful combination of luxury and comfort. Visit restaurants and bars in Nyhavn or enjoy a peaceful moment at the Kyssetrappen steps in front of our hotel. Travel in style during the week and at weekends when staying at our hotel, Scandic Front. Stay in shape in our fitness centre overlooking Copenhagen harbour and enjoy a good night's rest in one of our hotel's newly-renovated, modern rooms, some with 2 floors and a high loft. From some of our rooms, you can enjoy views of the Opera House and Copenhagen canal. Meet friends and colleagues for a drink in our contemporary hotel bar, which is also a popular meeting place for locals. When you feel those hunger pangs, you can enjoy a fantastic dinner in our restaurant. Our professional conference hosts are ready to arrange a meeting or larger event in one or more of our 3 flexible and well-equipped meeting rooms with inviting views. Our hotel is a popular venue for events, receptions and other occasions. Hotel Scandic Front is located in the heart of Copenhagen at the start of popular Langelinie harbour – just opposite the Opera House and within walking distance of the Royal Danish Playhouse. A wide variety of bars and restaurants is available just around the corner and along the canal in Nyhavn. The best shopping in Copenhagen is within walking distance of our hotel, and an obvious choice when staying here is to visit the well-known galleries and auction houses in Bredgade. Taxis can collect you and leave you right to our door, and if you need public transport, you can catch a bus right outside our hotel or take the Copenhagen metro at Kongens Nytorv. Scandic bicycles are available for our hotel guests – but be quick as they are in high demand in the summer. Parking – arriving by car? Parking in Copenhagen has never been easier. Right in front of our hotel is a large underground car park where you can park for a fee. Our cosy restaurant features beautiful design details and warm colours. Sit back in the comfortable sofas in our bar and let our bartenders mix your favourite cocktail. 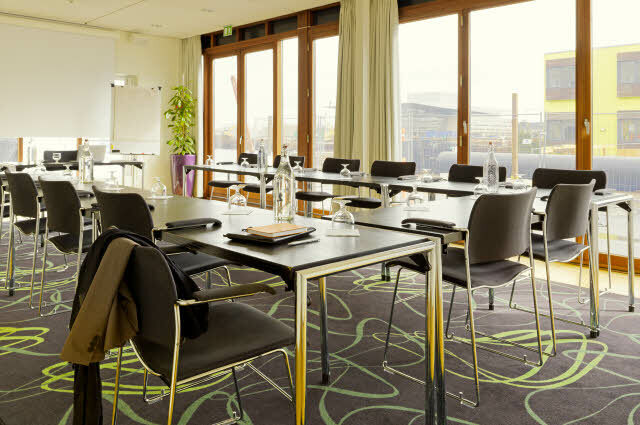 Scandic Front organises various meetings and events and has 3 flexible and fully equipped meeting rooms.